Being out of home I lacked good tea. So as soon as I returned back, I brewed the third of the 2007 minibeengs produced by San Ho Tang Tea Factory under the Xi Zhi Hao brand. You can find my notes on the Yi Wu minibeeng and the Din Jin minibeeng here. The last two teas had certain flaws. 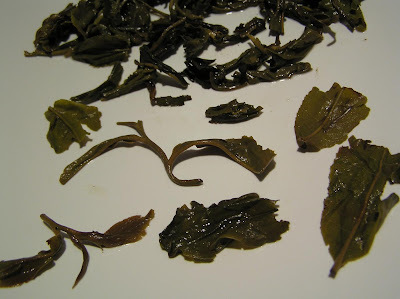 While I disliked the poor leaf quality of the Yi Wu minibeeng – problem probably found only on few last made beengs – the Din Jin was processed in very unusual way, it tasted like the leaves were overfermented before the kill green step was done. Is at least the Xue Shan worth the money? Lets see. As Guang wrote, the tea trees the mao cha comes from are located close to Wu Liang Shan of Si Mao, east of Ling Cang from mostly around 300 years old plantations. 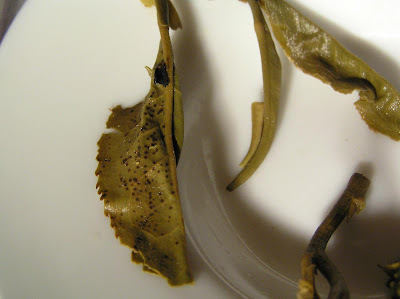 The beeng is heavily compressed, on the leaves is clearly seen the pattern of sack the tea was compressed in. 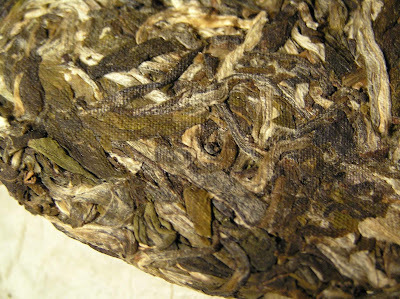 If I compare it to relatively loose 2007 Da Xue Shan from the same factory - Chang Tai - this one looks hydraulic pressed. 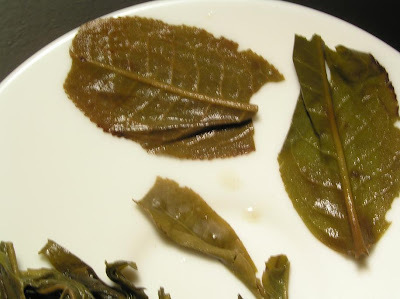 Separating whole leaves is possible, but it requires lot of precise effort. The leaves are very colorful – silver, yellow, all shades of green. The liquor is light yellow, thick and clear. This tea is definitely sweet, very sweet without any acidity. The brew leaves slight hint of smokiness and a bit more bitterness in mouth. The floralness I found in the Da Xue Shan beeng does not occur here. Aftertaste is long, sweet, lingering. Tea lasts long enough and even in later brewings it's strong enough to kick me in the head. The spent leaves are ok, but more than few of them are black-dotted, like they were taken from sick trees. Will I buy this tea? No – I don’t like enough how it tastes to spend the rather large sum on these minicakes. Instead I decided to purchase few of the Yi Wu minibeengs to store, age and consume them later on. Hopefully that batch will be made from higher quality mao cha. 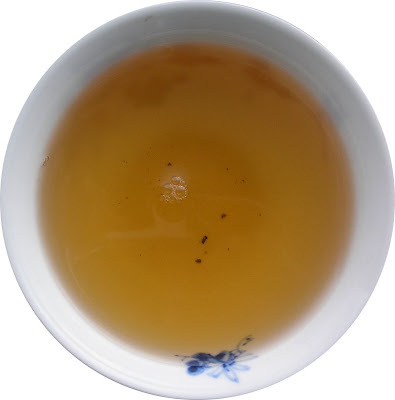 Full name of this beeng is 2007 "5th Internatiol Aged Puerh Appreciation" Memorial beeng.This pu-erh was blended by Mr. Huang Chuan-Fan of Jing Mei Tang and processed by Chang Tai Tea Factory. Same blender and same factory produced the 2006 Taipei Tea Expo Memorial Beeng. But the characters of these two teas are totally different. 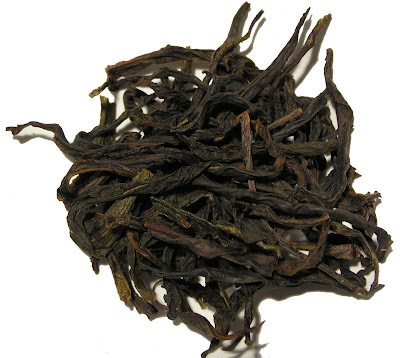 As seller, Guang from Hou De Asian Art states, this beeng is made of mao cha from Bulang, Nan Nuo and Ge Lan He areas with some big leaf mao cha from old plantations in Nan Nuo that was harvested in 2006. This tea cake was produced to commemorate the 5th internation aged pu-erh meeting. 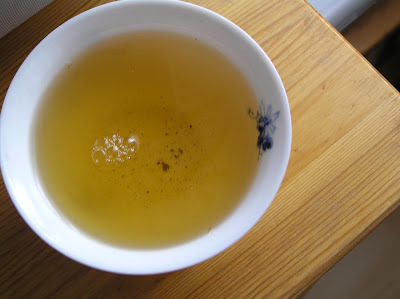 You can read the report on various blogs, most detailed is on Phyll Shengs blog – parts I, II, III, IV and V.
I decided to retry this tea after discussion with Phyll, who said that this beeng isn’t very good. The leaves I used are from sample – the beeng is probably light to medium compressed,since most of the sample fallen into separate leaves. 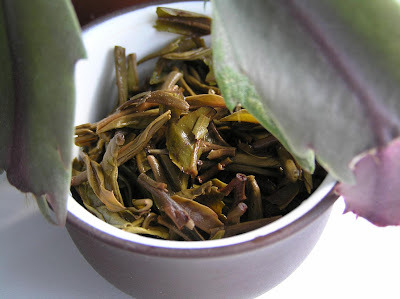 If you look at the picture, you can see how different leaves are in this beeng – they prove, that the mao cha was really blended from very different sources. The liquor is clear, dark yellow with strong, smoky smell. The taste follows trails of smell - it isn't particularly nice. The taste is full bodied, harsh and heavy with very strong smokiness, nearly nicotinic one. Lots of caffeine makes this tea bad to drink late night. On the other hand, when I forgot and overbrewed the fifth infusion (approximately 15 minutes), the tea was still drinkable. It's hard to enjoy this tea right now. It’s too strong, astringent, very smoky. On the other hand, the aftertaste is long, lingering and sweet. This tea could be nice - in year 2027, it certainly needs lots of aging. I have three beengs in my stash, so I will let you know when they will be 20 years old. Today at work I decided to try another Darjeeling. This one is from Thurbo plantation in India. The FTGFOP acronym could mean Far Too Good For Ordinary People, but actually it is Finest Tippy Golden Flowery Orange Pekoe. While the definition of Orange Pekore is used to identify a large leaf size characterized by long, thin, wiry leaves, the actual leaves are quite small. They are very colorful with emerald green leaves and much darker and very hairy tips. The liquor is orange, not as dark as red teas should be, but this darjeeling certainly fermented more than a green, white or yellow tea would. 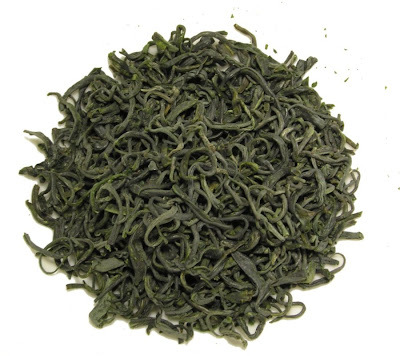 The seller declares that this tea is fermented for about an hour and half, total fermentation is 65-70%. As I experience darjeelings, they are each year greener and greener. It’s an OK tea, tasty, fruity. It lives long enough for three good infusions; I like to drink it at office, when I do not have either time or opportunity to prepare something better. Phyll recently restarted his Adventures in Tea & Wine after a hibernation lasting nearly one year. To celebrate it I decided to drink today sample sent to me by him. The story of this tea is quite fierce. It was posted by Guang during Big Pu-erh Price Bubble and after I made a comment about it on LJ Pu-erh Community, it was sold out within 24 hours. What do I know about this tea? It’s a special-order tea, meaning it’s probably higher quality than standard products. 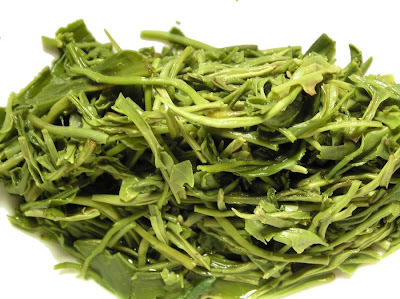 The mao cha it’s made of is probably harvested in 2000 and processed a year later. The sample smells really good giving out a typical Yi Wu smell, sweet, woody, flowery. The smell reminds me of 2000 Chen-Guang He Tang Yi Wu brick or 2001 Chung-Hwa Yi Wu "Jin Yeh Hao" beeng. Tea feels aged and it’s aged in the right way – no sign of too wet storage, there isn't musty or pondy smell. This tea is about eight years old and the liquor turns orange, as it should. The smell of the tea is woody, fruity; I definitely like it a lot. Compared to Lao Ban Zhang beeng I wrote about last time is this tea much tastier, even if maybe not quite as powerful. 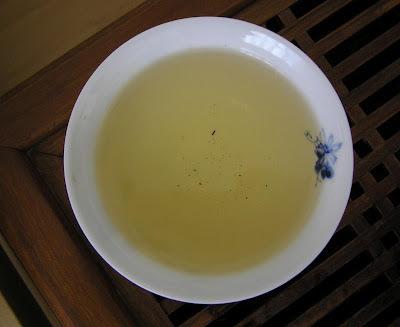 The smell in emptied fairness cup is dominantly spicy, reminds me of 2003 MengHai "BuLang Jing Pin". The wet leaves are turning from green to brownish; since it is sample I do not judge the wholeness of leaves. I like this tea a lot. Definite recommendation, if you will be able to get some. Thanks again Phyll for sharing it with me. The San Ho Tang tea factory is producing luxurious pu-erh, at least in the eyes of many pu-erh fans. Though the recent production is somewhat controversial, the first and maybe first half of second year is seen as really good. 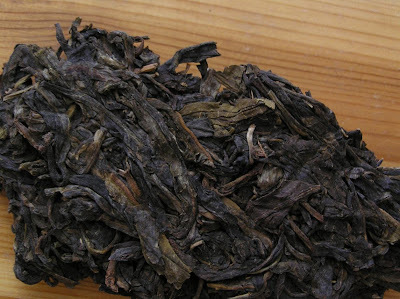 San Ho Tang produced two test runs of pu-erh – 1997 Yi Wu and 1999 Meng Sa. It started the regular production in 2005, producing Lao Ban Zhang, You Le and Nan Nuo beengs. I was able to acquire the last two, but from Lao Ban Zhang beeng I have only a sample. As always in samples, I do not judge the wholeness of leaves, since they broke when the sample is taken from the beeng. Today I brew the leaves that fallen off the sample. 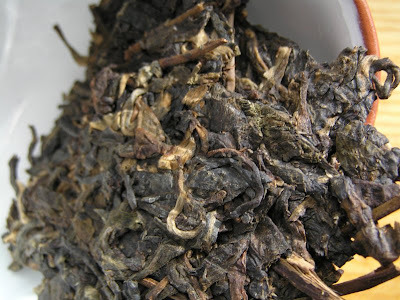 This beeng is made from sun-dried mao cha from old semi wild plantations in high altitude in Bulang mountain range. 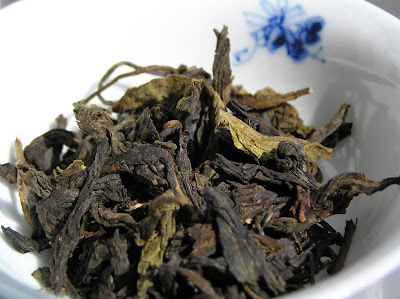 This is very similar to 2006 Xi Zhi Hao Lao Ban Zhang beeng, though the leaves are somewhat darker, probably because they aged a year longer. This is a fine pu-erh. It produces yellow, thick soup with nice, calming fragrance. The tea lasts long; from about 5 grams of leaves I was able to make 8 infusions, about 1 liter of tea. I started with very short infusions, gradually prolonging them, the last ones were few minutes long. The aftertaste is nice. I believe this tea is very similar to its one year younger cousin. I like it, but I miss the real character. Maybe some flaws, or stronger aroma. This tea will be probably highly valued by collectors, but I like the Yi Wu teas much, much more.